“Seven days you shall eat unleavened bread. On the first day you shall remove leaven from your houses. For whoever eats leavened bread from the first day until the seventh day, that person shall be cut off from Israel [relationship with God]” (Ex. 12:15). Why? “So you shall observe the Feast of Unleavened Bread, for on this same day I will have brought your armies out of the land of Egypt” (Ex. 12:17). In His initial command for these days, God specifies that they (and we) do this to commemorate something He was doing for them. This is still true today—we keep these days as a reminder of what God has done for us and is doing for us—not something we can do or are doing ourselves. When you read through all the various commands for and descriptions of the Days of Unleavened Bread in the Pentateuch, each time it reiterated this command to eat unleavened bread for seven days. In fact, it’s commanded 11 different times (that I counted) in those five books alone. In reading through each of those passages, it’s clear that the emphasis is placed on eating unleavened bread, rather than on a deleavening process. For us today it is a reminder that we must repent and ingest Christ DAILY (our daily bread; Matt. 6:11) to remain in a relationship with God. We could repent all day long, but without having Him in us and being able to apply His sacrifice to our sins, it would all be pointless. At the Passover we partake of the unleavened bread and wine as He commanded, commemorating the covenant we entered into at baptism, made possible by the wiping away of our sins with Christ’s sacrifice. Then in the seven days that follow, we continue to take in unleavened bread each day to picture our continued commitment to abiding in Christ for the remainder of our physical lives, and our need to have His spirit renewed in us daily. The Days of Unleavened Bread are about grace and hope and redemption despite our unworthiness, not about beating ourselves up for how often we fail or trying to remove sins ourselves—because we can’t. God deals a lot with food analogies, what you put into yourself—you are what you eat, spiritually speaking. 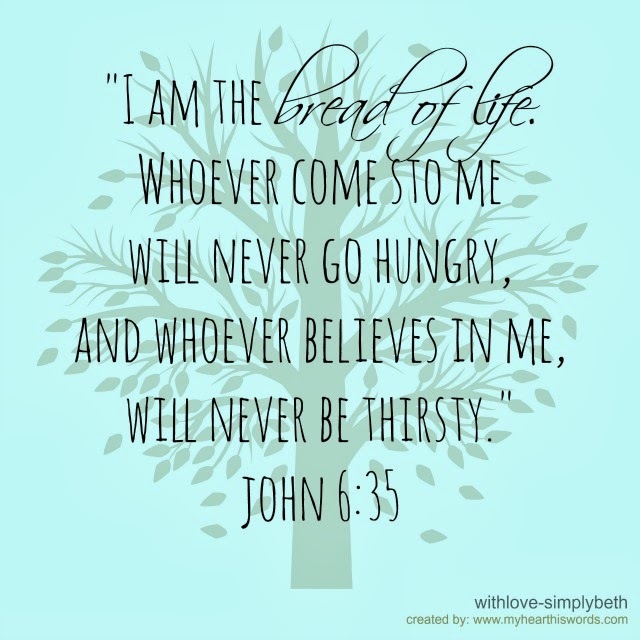 Pure unleavened bread only needs a few ingredients—grain (the harvest, wave sheaf, firstfruits), oil and sometimes water (holy spirit, living water), and salt (purifying, adding value/flavor, causing thirst). In biblical times, before all the chemical leavening agents we have today, bread was leavened by adding a pinch of the previous batch of dough to it (to help the process along), and then just letting the yeast in the air do its work over time. But without that pinch of leavened dough added, unleavened bread has no history, retains nothing from a former life—it is truly a new, pure lump. We are also supposed to be made completely new, all our past and all our sins washed away; we have to be careful not to bring anything corrupting from our old life into our new one. Leavening is an agent of change, which can be positive or negative. While the changes caused by leavening start out as invisible, they eventually become outwardly apparent if left unchecked—and they will continue to rise and grow and expand until something stops them. Even the tiniest pinch of leavened dough will fully permeate the dough eventually, relentlessly spreading and searching for new unleavened areas to attach itself to. That word translated “sincerity” here means clearness or purity. People try to complicate Christ, complicate His instructions and God’s truth, putting their own extra layers and requirements into it and then judging themselves and others by these self-made requirements. But that is not what Christ came to institute—in fact the only people He shunned were the religious leaders doing just that. Nor is that what His apostles carried on after His resurrection. Paul even warned the Corinthians that he feared that somehow their minds would be “corrupted from the simplicity [can also be translated ‘singleness’] that is in Christ” (II Cor. 11:3). The purpose of all of this is not to say that we shouldn’t deleaven our houses, and certainly each individual should do what they feel God requires of them. It’s also not to say that we should literally physically eat unleavened bread every day of the year. This is really food for thought. If intensive vacuuming and a checklist of personal (already repented-of) sins are the hallmark of meaning for us during the spring holy days, we may be missing the point altogether. Even in the Old Testament, God’s emphasis for the Days of Unleavened Bread was on what He provides for His people. And what He provides to us today is mind-blowing. A Savior who pays our debts and wipes away the death penalty our sin incurs. Who makes it possible for us to come before God by giving us His spirit. Who ultimately offers us the chance for eternal life in His kingdom. It may seem strange for me to post this after the Days of Unleavened Bread are over and we’ve all gone about our business, ordered pizza and re-purchased baking powder for pancakes tomorrow. But to me this will serve as a reminder that our focus during these days—and throughout the coming year—shouldn’t be solely on getting rid of sin, but on partaking of Christ, and the fact that it is only through God’s mercy and grace that this is even possible. Hopefully our minds will remain cognizant of the fact that the need to take in the unleavened bread of Christ every single day extends beyond these seven days, encompassing every remaining day of our physical lives.